Language learning isn’t all about memorising verb tables and vocabulary lists, or spending sleepless nights wondering if you’ll ever master the Spanish subjuntivo… it’s about immersing yourself in the culture and living the language in context. And the great news is, there are ways of improving your language skills by kicking back and relaxing. Sounds too good to be true? Watching TV shows in the target language is a really effective way of tuning in to a language, getting used to the speed, intonation and varying accents, and training your brain to be able to follow real conversations – and the more you watch and listen, the easier it will become. Another bonus – there are some fantastic programmes out there which are genuinely, really enjoyable to watch. So, for you Spanish learners out there, here are our top picks of the moment. Anyone who’s studied Spanish knows how daunting listening in the language can be at first – the speed and rhythm often creating fuzzy heads. There are two great shows however, that can ease students in, given their simple format and clear context. RTVE’s Españoles en el mundo is a really well-done travel documentary series with a very manageable concept for learners. Spanish expats around the world are interviewed about their lives in their adopted cities and guide the presenter around some of the destination’s highlights. The visual side – showing landmarks, cuisine, traditions - means it’s always clear what’s being discussed, and therefore vocabulary can easily be picked out and general comprehension is achievable. Viewers are exposed to different Spanish accents, which is useful, and can also learn some interesting facts about the world – a nice extra! Destino España is another good example from RTVE with a similar, although reversed, concept – expats from around the world who have made Spain their home tell us about their lives and what they enjoy about living in their Spanish hometown. The programme is a great way to learn about Spain and some of its hidden corners, and the (more often than not) non-native Spanish means that the pace is often a little slower and the vocabulary somewhat simpler. As with Españoles en el mundo, the visual side of things means the topic being discussed is generally very clear too. Moving up a notch, you’ll want something that involves a little more concentration and exposure to some broader language. Earlier this year Netflix released Tiempos de Guerra (translated as Morroco: Love in Times of War). This period drama has a captivating storyline that really pulls viewers in with its likeable characters, ups and downs and emotional twists and turns. Being a period drama, the language is perhaps what we could refer to as ‘classic Spanish’, meaning lots of good vocabulary is up for grabs. The plot is relatively straightforward meaning the episodes aren’t too difficult to follow, and the challenge of ‘completing’ a foreign language series is achievable. ¡Olé! This is where you can really take your Spanish to the next level and start getting to grips with more complicated story lines, stronger accents and some intriguing slang. Walter Presents is a great platform for foreign language series, and Vis-a-Vis (translated as Locked Up) is seriously gripping! This fast-paced prison drama is perfect for binge-watching, and exposes viewers to lots of informal, alternative language and slang. Concentration is needed in order to fully follow, but for those up for a challenge, Vis-a-Vis can really help with comprehension and fluency. Finally, we couldn’t not mention Narcos. This Netflix series took the world by storm, and although lots of the dialogue is in English, the Colombian Spanish is a great comprehension exercise. The language can be challenging, but once viewers are tuned in to the accent and linguistic style, it’s a great way to step away from ‘text-book Spanish’, and enhance your listening capacity. The storyline is, of course, also amazing! Do you have any other recommendations? Let us know by getting in touch with us on Facebook! Where Can You Study Spanish with International House? Whether you're interested in learning a language in your spare time, or heading off an a Study Abroad adventure, IH has a wide range of options. 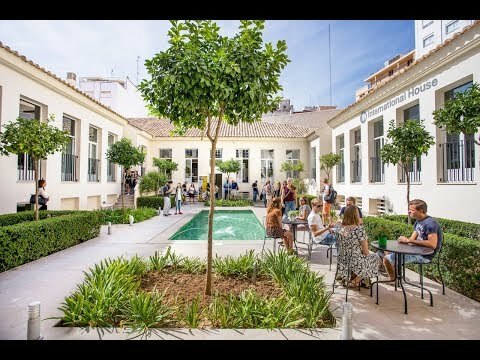 Find out about language schools near you offering Spanish here, or get inspired by our Spanish Study Abroad opportunities in four different countries.